Personalized 24" x 14" Address Plaque with Fretwork Frame - - very large, very impressive estate sign with elaborate fretwork frame. Made in USA. Whitehall Mears Fretwork one-line or two-line decorative plaque available for lawn or wall mount. The one-line version holds up to five 5.5" numbers. The two-line version holds up to five 4" numbers on line 1 and up to seventeen 1.75" characters (including spaces) on line 2. 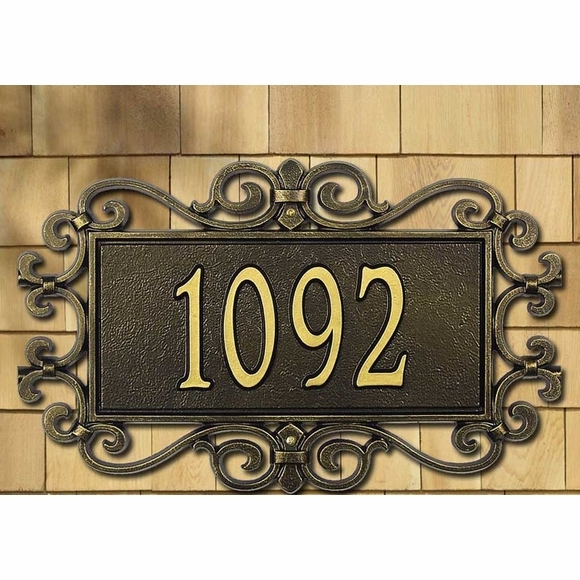 Like all Whitehall personalized address plaques, the Mears Fretwork decorative plaque is crafted from rust-free recycled aluminum. Three color combinations: BG black with gold characters; AC antique copper; OG bronze with gold characters. Dimensions: 24"W x 14"H x 0.5".